Summary: A daughter’s longing love letter to a mother who has slipped beyond reach. 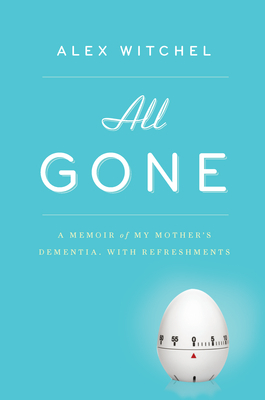 I had very personal reasons for picking up ALL GONE: A MEMOIR OF MY MOTHER'S DEMENTIA, WITH REFRESHMENTS by Alex Witchel. Mainly, I was interested in reading more about how a daughter coped with taking care of her aging mother since it's a subject that more and more of my friends are facing as their parents (and grandparents) get older. I wasn't exactly sure it was the "right" read for this time of year when I tend to read "lighter" fare; however, I had read enough reviews to know that this book did have it's funny moments. So I figured , "what the heck!" First, I felt as if Ms. Witchel wrote a beautiful tribute to her mother. She demonstrated how special her mother was as a mother, wife, and teacher in a time when women weren't able to "do it all". In addition, she showed the ups and downs of a mother-daughter relationship, as well as the many ways her mother's words and advice came to fruition throughout her life -- even in her adult years. I found many of her sayings to be inspirational and touching. Next, I thought Ms. Witchel did a nice job of incorporating her mother's recipes into ALL GONE. As her mother progressively got worse, Ms. Witchel was able to find comfort in cooking her mother's old recipes. It was a form of therapy for her, and she even included a few of them in the book. I didn't find any of these recipes to be particularly mouth-watering -- most were pretty basic and used a lot of prepackaged foods; however, I did appreciate how these meals brought back fond memories of her mother and her childhood. 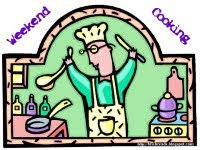 Just to give you an idea, here are some of the recipes: Frankfurther Goulash, Chicken with Prunes and the more normal Roast Chicken. Finally, I liked how Ms. Witchel provided so much honestly in ALL GONE about herself and how she coped (and didn't cope) with her mother's illness. I think Ms. Witchel's emotions and reactions to her mother's descending spiral into memory loss were probably very realistic and ones that many adults experience in one form or another. I also adored how she showed that as she was "losing" her mother, she was also gaining an appreciation of her. As a daughter and granddaughter, I found it to be beautiful and touching. I would be remiss if I didn't mention that there was something I found a little strange about this book. For the most part I enjoyed ALL GONE and thought it was very good; however, I did think that Ms. Witchel provided too much information about herself and her life that wasn't pertinent to her relationship with her mother. There were many personal stories about Ms. Witchel's childhood, her relationship with her husband Frank Rich, and her stepson. I realize that ALL GONE is ultimately Ms. Witchel's memoir, but I definitely appreciated the parts that were more geared towards her mother and how they handled her illness. I hope that many people will find some comfort in this book and Ms. Witchel's words. It's a special tribute to mothers and daughters, the healing power of food, and anyone who has ever taken care of someone who is sick. I guess it's hard not to insert all of your life into a memoir. This sounds good but I may wait until the holidays are over to read it. I'm not a memoir reader, but after listening to my mom's experiences with taking care of her father these last years, I don't think this is something I want to read. At least not right now. I may eventually want to read this for the same reasons you did. Plus, I work with seniors with dementia. I like the way she integrated her memories of food into this one. This book is on my TBR list. I helped care for my great grandmother, who lived with us when I was growing up, who was afflicted with dementia.